Limited time only - $19.95 off MSRP and FREE pair (2) of Breathable Pads with the purchase of your StudiBag pet carrier. Help protect your carrier for years of traveling with your pet. Do you have a pet with long legs? 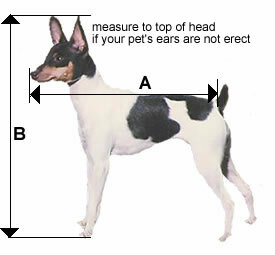 Is your pet's standing height under 16" (40.6 cm)? Are you traveling with a cat? Then this pet carrier is for you. The SturdiBag carrier is one of the best choices for airline in-cabin travel for those pet owners with dogs or cats that range up to 18" long (tip of nose to base of tail) and 16" high (top of head to ground). The pet carrier is weather proof, has a well-secured washable pillow, toy storage pocket and leather hand-grip. It's available in black, red, pink, and tan colors. It is roomy for your pet, light for you to carry, and can handle up to 40 pounds of weight but is recommended for up to 25 pounds (11.34 kg). A quality carrier, the SturdiBag will provide your pet with the utmost of safety and privacy while lasting you a lifetime with proper care. This resembles a miniature camping tent as it "squishes" down to fit under the seat while not collapsing on your pet. While it is truly sturdy as the name implies, it is also lightweight - a real plus when traveling, showing, or even taking a cat or dog to the vet. The zippers are easy to close with one hand. Two mesh windows on top of the carrier and on the two end panels offer plenty of ventilation. When closed, the carrier is pretty much weatherproof. The zippered floor panel contains a durable foam-core floor that can be removed and replaced; it can also hold a heat or ice pack if necessary. That same compartment is roomy enough to store a towel or two, and a small end pocket would be nice for treats, or a small bit of food or some paper towels. This best pet carrier has won multiple Choice Awards with both Cat Fancy and Dog Fancy magazines as well as recommendations from Schools of Veterinary Medicine. It is widely used by pet breeders and those in the show industry who travel with their pets often. You will not be disappointed with the quality of this carrier. As it is a flexible carrier, it affords the possibility of fitting in a space that is less than the 12" height of the pet carrier. We recommend that you contact your airline and ask for seat clearances if you are considering the extra large size SturdiBag carrier. You will need a 20" clearance in width to accommodate the carrier. Oftentimes the airlines will give you recommended sizes for in-cabin pet carriers. Remember that sometimes the measurements they provide are for rigid carriers that do not compress. 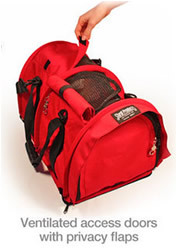 They do not provide measurements for soft sided pet carriers, although they are accepted. We would also suggest that you consider protecting your carrier with a quality pet pad (click here). Our smallest size pet pads fit our pet carriers and provide protection against accidents from nervous pets. Want to see more airline compliant pet carriers? My yorkie loves her sturdibag. She naps great in it and draws no attention to people wanting to pet her. Highly recommend!. She's 3 months and weighs under two lbs and I purchased the small. Thank you! Great service. Fast delivery but expensive. My cat likes it so far. We are going overseas with him soon so right now we are getting him used to it by letting him play in it and nap inside. He is a big cat so we were concerned the small one would be too small. While he can't stand fully upright, he can crouch, turn and sleep curled up. There are only one thing II wish were different. The hard shell base takes up space and adds weight. A flexible plastic sheeting base would be better. Jason went above and beyond to help me with my questions about taking my cat to the UK. He is very knowledgeable and kind. This is the best carrier for getting my cat on our domestic flight from Vegas to San Francisco. It gives the most room while still meeting the airline's limited measurements. We also bought a kennel to transport him on the international flight and again Jason gave great advice about what to get. Love this company. Great people and excellent customer service. I'm very grateful for Jason's help and highly recommend. Communication was great, they didn't have the correct color I wanted in store but did give me the option to either wait or ship another color, wanted speed over color. Item arrived quick, its solid construction and the cat does like it. I had one small issue that was putting in the support poles at the top, was a little tight and hard to get in but did manage it. Great item and exactly what we wanted quit happy with product. Relaible, convenient and durable staff. Great carrier for cabin travel! It was my first international air travel with a cat and was worried as each aircraft has different under-seat dimensions. I used United Airline with partly code share with Brussels Airlines and the SMALL carrier fit fine under three different types of aircraft. Even if it kind of sticks out in the smallest flight, flight attendant did not really care much. When securing a space in cabin for a pet, ensure that the carrier meets the dimension requirement of airline company. I guess that this carrier may be fine for most of the airlines. My cat seems to like the carrier (it helps to be a cat who likes to be under small space anyway). Nice to have screens that ensure air flow as well as to check she is ok. It is nice to have the chain to connect her to the carrier to make sure she won't escape during the travel as well. One of the wire came out during the travel and was hard to put it back in the slot but it kept shape without it so it was fine. our poodle ran inot his carrier and fell asleep! Just ordered a small sturdibag for a trip to Puerto Rico. Our 6lb toy poodle loves it. It was very simple to assemble. It is a bit short in height for him because he has very long legs. The large would be better but we were afraid the airline would think it was too big-their maximum height for a soft carrier is 11 inches. But the pad is very soft and comfortable and he sleeps in it already. The carrier is so light to carry.